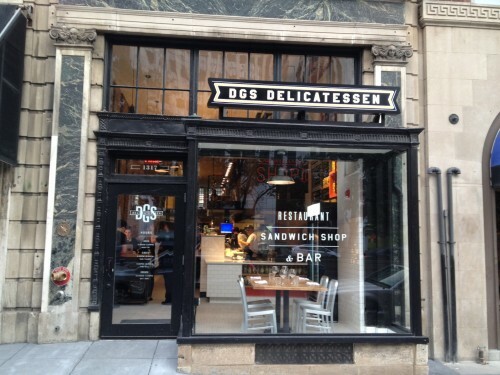 Beginning May 7, DGS Delicatessen will offer a new, to go lunch menu available from 11:30 a.m. – 2: 30 p.m., Monday to Friday. Guests can now order lunch to go from the restaurant’s new sandwich counter, which offers the famed DGS Pastrami and Corned Beef sandwiches. The full menu, below, is only available at the sandwich counter and features items designed to travel well, especially when a more leisurely sit down lunch is not an option. To mark the official launch on May 7, the first 50 people in line will receive a pastrami sandwich on the house. Also available at the “Sandwich Shop” counter is a new selection of house-made DGS condiments and ingredients for sale, including: Harissa ($6), Dill Pickles ($9), Schmaltz ($5), Hot Sauce ($5), Smoked Maldon Salt ($10), and Deli Mustard ($6).